This recipe is from Jamie Oliver’s latest TV Series, Jamie’s Great Britain. 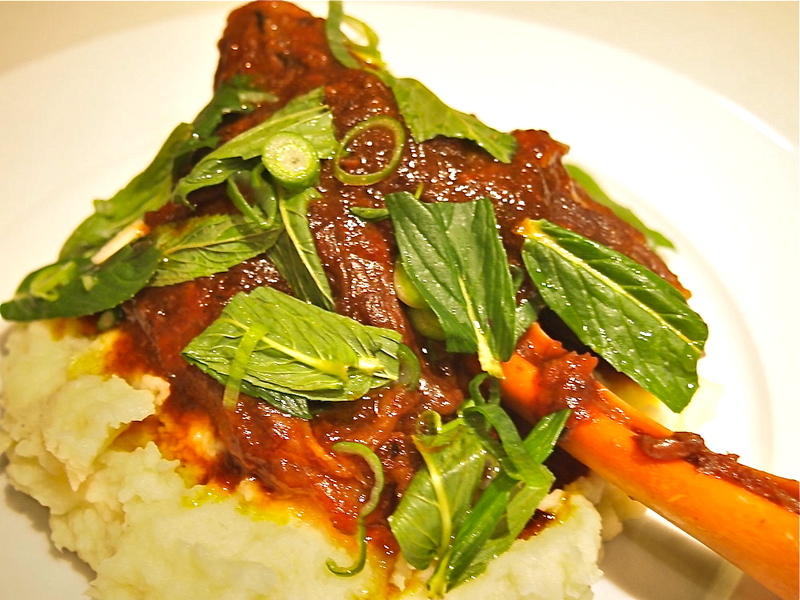 On the show he refers to these as Persian inspired lamb shanks with ale. The night before Jamie had dined at a Persian restaurant in Leeds and came up with this recipe – he’d also visited an ale factory the same day, hence the mingling of the two rather obscure themes. I couldn’t really see the Persian influence in the dish but it looked delicious. 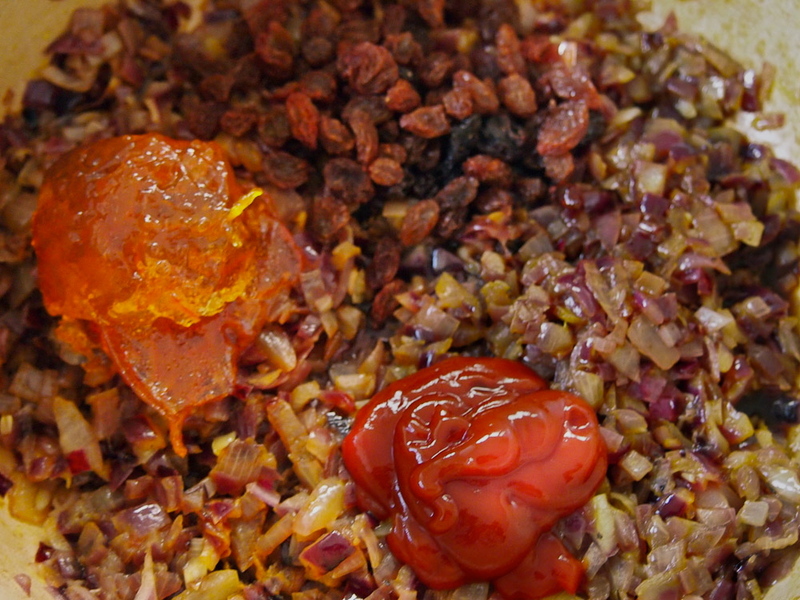 The unusual inclusion of ingredients such as marmalade, ketchup and raisins work together well and give this dish a hint of background sweetness. The sauce at the end of the cooking time is pureed, which gives it a lovely smooth, velvety texture. Jamie also said that the spring onion, mint and vinegar salad that is strewn over the shanks just before serving is a must, and to not even bother making the dish if you weren’t going to do that. He was right, the addition of the sharp spring onions and mint woke the whole dish up. I served it with celeriac mash as per Jamie’s suggestion. 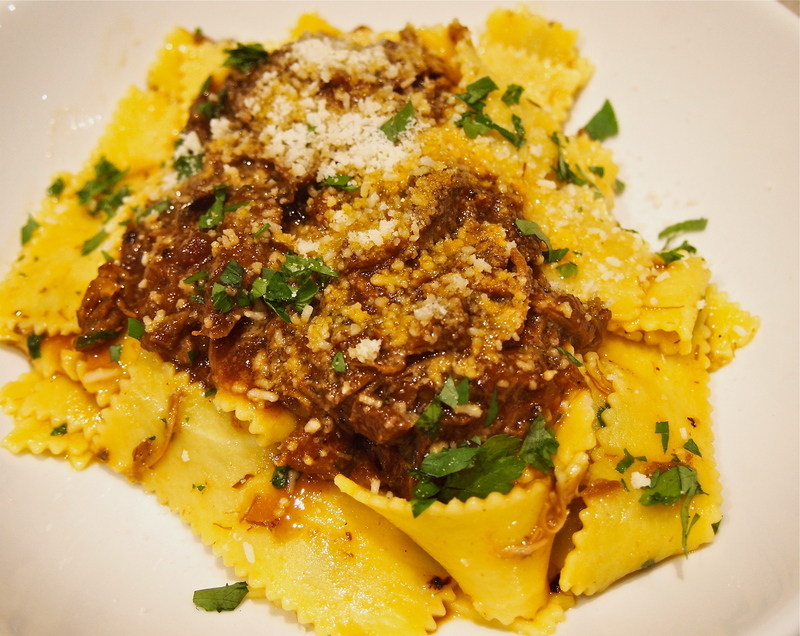 This quantity makes a lot of lamb and sauce and even though I was cooking for 2 I made the whole quantity and shredded the meat and sauce to serve with pasta on another evening (picture below). Finely chop the onions and put them into a large cast iron casserole, with a some olive oil and a good pinch of salt and pepper. Cook over a medium to high heat, stirring, until the onions start to caramelize. Add the raisins, marmalade and ketchup, then add the Worcestershire sauce and Guinness. Stir well, then leave to gently simmer. 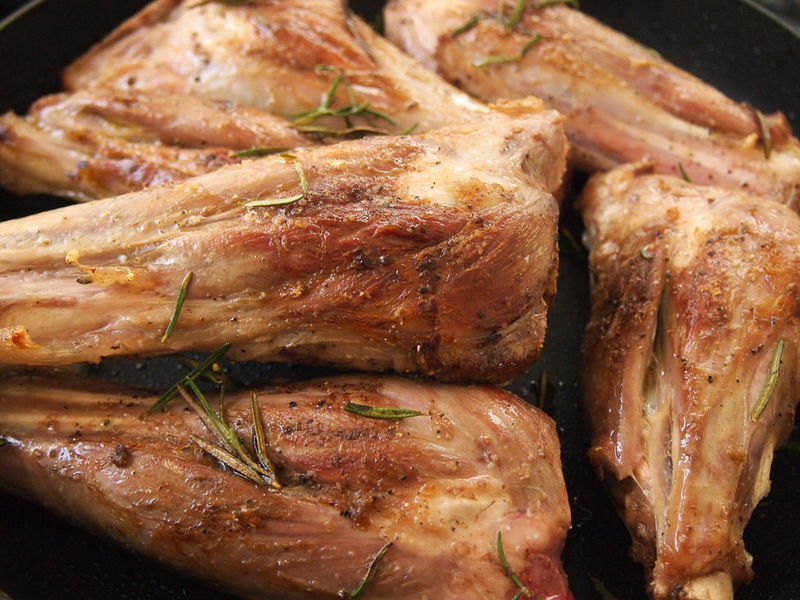 Put the lamb shanks into a large frying pan on a medium to high heat with a drizzle of olive oil – cook in batches if necessary. Turn them every few minutes; once they have some good colour, add in the rosemary leaves and move them around in the pan to get crispy, being careful they don’t burn. Transfer the shanks into the pan of onions, then pour in all their juices and the crispy rosemary. Add the stock and bring to a boil. Put the lid on, turn down the heat and leave to simmer slowly for around 3-4 hours, or until the meat falls off the bone easily. You can also put them into a 160C oven for 3-4 hours. Try to turn the shanks halfway through so they cook evenly. When the lamb shanks are ready, carefully move them to a platter, making sure the meat stays intact. Liquidize the gravy with a stick blender until smooth, then allow to reduce down and thicken slightly. Finely slice up the spring onions and toss on a plate with the mint leaves, a drizzle of cider vinegar and a pinch of salt. Add a little splash of cider vinegar and a few more splashes of Worcestershire to the sauce, then ladle it over the lamb shanks. Scatter with the vinegary spring onions and mint leaves all over the top. 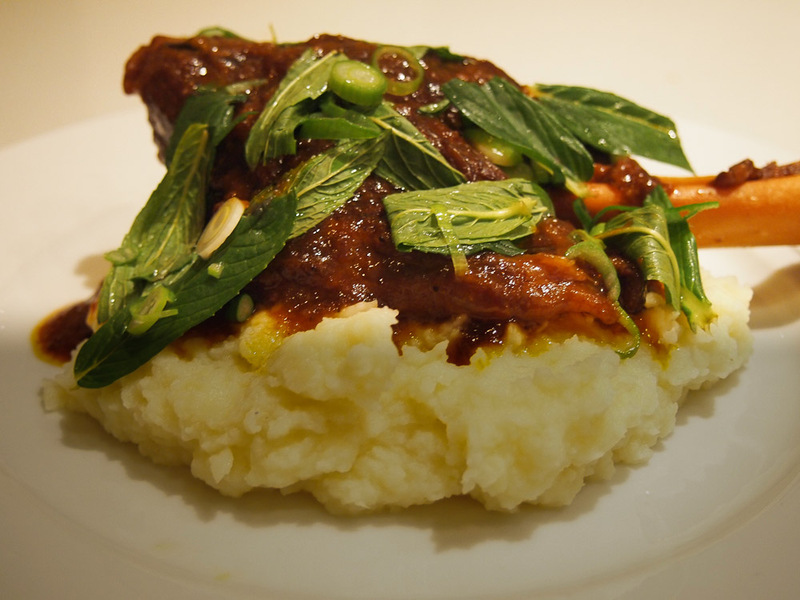 Wow, my husband and daughter love Lamb Shanks…. the different flavours sound like they would clash, however, I will do my best to serve it up as per your insistence that the mint and onion must be sprinkled on the top. Vegetarian or not, it looks delicious and perfect for this supposedly freezing weekend ahead. Hi Porter, I know the ingredients seem a bit unusual but they do work together – I think the main ingredient that might overwhelm is the marmalade so be light handed with it. Hope they like it.